As one of Renaissance music’s most beloved figures, Flemish composer Guillaume Dufay (1397-1474) has been represented through a slew of fine recordings from such groups as the Hilliard Ensemble, the Medieval Ensemble of London, and Pomerium. 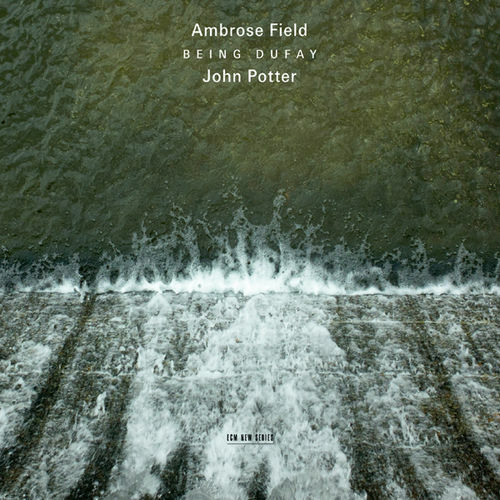 Though known more for his sacred works, Dufay’s secular chansons find new life here in English electronic composer and performer Ambrose Field’s awe-inspiring soundscapes, with the Hilliard Ensemble’s John Potter at their center. Potter recorded a mere eight minutes of actual singing for an album just shy of fifty, and from this throated nucleus Ambrose Field has cultivated a lush molecular accompaniment. Potter sings an alluring chanson, bathed in a tender drone, in the introductory Ma belle dame souveraine. Both the melody and its nebulous aura seem to come from a distance. This is one of the more minimal arrangements on the album and as such carries us gently into its unique sound. Je me complains boasts a more pronounced electronic presence with its flanged vocal samples and extended metallic fades. It feels very digital, ending in a viscerally epic swell of synthesized chords amid a fine weave of heavily processed voices. Being Dufay begins with a highly processed and extended vowel, and from this Potter emerges with a more clearly articulated “live” form of the same, spinning from this massive jumble of threads a clearly discernible path for us to follow. Certain phrases become looped before being swept away in a tide of reverb. This density soon relaxes into an even deeper stretch of sound as Potter’s samples flit in and out of view until he reemerges from the cosmic static to gently hang his melody from the clouds. Je vous pri comes into being like a resuscitated lighthouse, not so much piercing as caressing the darkness with its fortuitous light. Along with Je me complains, this track is most effective at shifting between Potter’s solo passages and their ghostly afterlife. It’s also teeming with distinctly organic sounds, as hints of percussion, water, and wind are carefully placed throughout. This ends in a swirl of repeated motif, caught like a song fragment in the net of time before being hoisted out of earshot. Presque quelque chose is an electronic interlude, hovering just beyond the threshold of life and bringing with it the promise of a singer’s dream. Sanctus is built around a sacred chant, undergirded by a bass note that cuts out like a broken radio. Potter’s voice morphs into that of a woman (an effect achieved through Ambrose Field’s painstaking digital modeling), filling the space with a virtual choir. La dolce vista is very much like the first track, giving Potter’s voice full reign of its territory as it glides into finality. In these settings, one can really appreciate the well-roundedness of the chosen melodies. This isn’t Dufay in outer space, for there is still something undoubtedly earthly about all of this. Even so, the album may not be for everyone. Avid listeners of electronic music may feel more at home, while Renaissance purists may find the electronics outrageously intrusive and might prefer an ensemble of carefully chosen instruments. Yet I believe this album strikes a happy medium between two forms of musical expression that are not so entirely different from one another, and I would encourage even the most reluctant to immerse themselves in its wonders. This isn’t just humility, for his statements are clearly evident in his respect for the tactile feel of analog equipment. The combination of digital and analog sounds strikes a fine balance between the former’s “cooler” tendencies and the latter’s heavy warmth, making for an overall effect that is, well, ambrosial. These pieces are the exact opposite of timeless, beautifully enmeshed in their contemporary technology, be it a band of minstrels, a church choir, or, in this case, an ocean of electronic information. In Dufay’s time, these songs were the supreme form of sound manipulation. They worked in real time, pulsed with an immediacy that required only a willing ear. And in today’s audio landscape, electronics have become equally ubiquitous. We are therefore privileged to hear Potter’s voice unmasked in such unobtrusive company. Even in the longest stretches of synthesized sound, Potter’s presence haunts and provides the foundation for much of the synthetic drive, so that we are never too far from the vulnerable pulchritude of the human voice. For the sake of live performance, filmmaker Michael Lynch created seven short subjects, one for each of these pieces, from which we are given only a few screen shots on the official site, and which one can sample below. Perhaps a DVD is in order?